Every summer the Finger Lakes Musical Theatre Festival presents a variety of musical theatre in multiple venues in Auburn, NY. Playing at the flagship location Merry-Go-Round Playhouse on Owasco Lake through August 27th is On the Town. A classic musical comedy based on an idea by legendary choreographer Jerome Robbins from his 1944 ballet Fancy Free and set to the music of Leonard Bernstein. The book and lyrics were written by musical comedy duo Betty Comden and Adolph Green. Most remember the MGM film adaptation starring Gene Kelly and Frank Sinatra. The story is relatively simple. Three sailors are on leave in New York City for 24-hours and aim to have an experience of a lifetime and while nothing goes according to plan, their time in the city is unforgettable. You may be thinking why would I want to go see an old musical from the 1940s? I can tell you once you sit in a seat at the Playhouse, you will be transported somewhere you never expected. The combination of an incredible ensemble of professional actors and dancers, a magical set, spot-on lights, costumes, wigs, makeup, a 10 piece orchestra, and projections that bring the entire experience into vivid focus, On the Town is anything but ordinary. At the helm of this production as director and choreographer is newly minted Producing Artistic Director Brett Smock. Smock’s vision for this show includes 15 foot letters spelling out New York on stage that also serve as screens featuring projections used to elevate the storytelling on stage. Not only is this show fun and full of surprises, but there are truly special moments along the way. Do you like theatre, but want to see something a little different? Check out The PiTCH. The PiTCH is a series of new musicals in development. Each week for 10 weeks, teams of three including the writers of the show present their idea for a new musical in an hour long presentation. Then you get to share their feedback on the show. This unique theatre experience takes place in Theater Mack behind the Cayuga Museum. The converted carriage house hosts cabaret style seating where you can enjoy an adult beverage while you watch. The atmosphere is comfortable and conversational. Summer in the Finger Lakes has so much to offer and while you may be enjoying the outdoors, take a break and see a show. With Broadway caliber talent for a fraction of the cost, it can truly be the highlight of your visit. Take a chance! 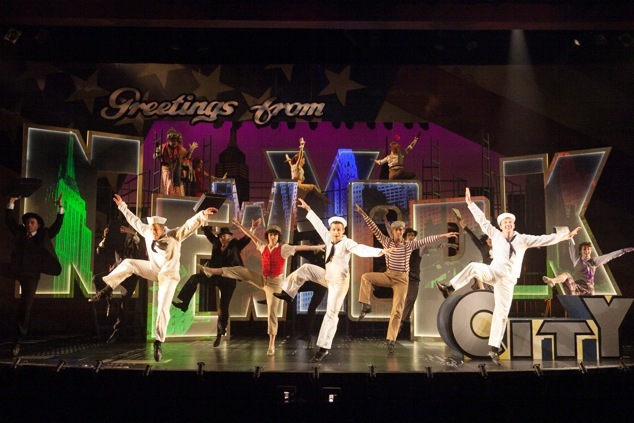 See On the Town at the Playhouse, you don’t want to miss what everyone is talking about. Visit FingerLakesMTF.com for more information or call 1-800-457-8897 for tickets. Kristin Bridges is Marketing and Creative Director for Finger Lakes Musical Theatre Festival. She is a Director on the Board of Cayuga County Convention and Visitors Bureau and Auburn Players Community Theatre. Kristin is an alum of the University of North Carolina at Greensboro and the American Musical and Dramatic Academy for Musical Theatre performance. Kristin is originally from North Carolina and has been a resident of Auburn with her husband Chris for 4 years.